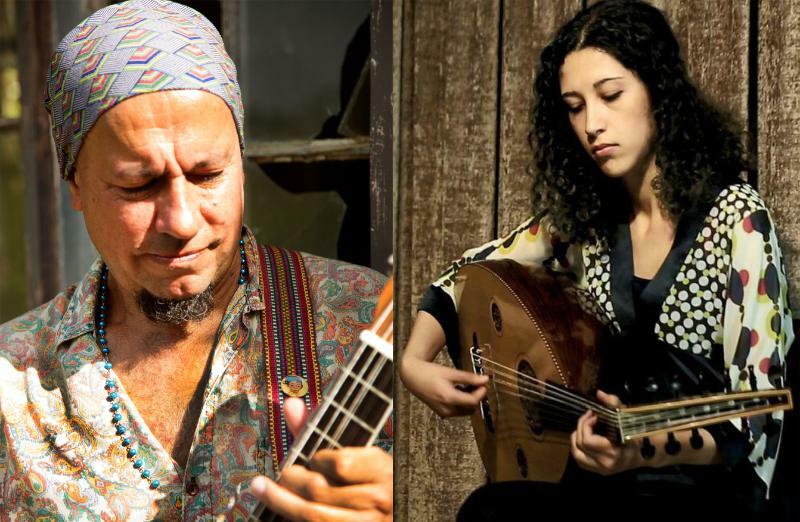 The Centre for Jazz and Popular Music will presents acclaimed South African Folk Roots guitarist Nibs van der Spuy who will join forces with Iranian, oud virtuoso, Yasamin Shahhosseini on the first Twosday gig for 2018 on February 20, 2018, at 18h00. The musicians plan to record an album on this tour in and between many shows on the road. Van der Spuy is one of the most extraordinary and exciting, world acoustic guitarists and exports to come out of South Africa. Raised in the fertile province of KwaZulu-Natal, he immersed himself in his natural environment to formulate a truly consummate and original sound. Growing up with the Beatles and learning first-hand from traditional Zulu Maskandi guitarists, he quickly soaked up a rich tapestry of his close surroundings and beyond. After playing the local folk scene around South Africa for years and gathering up a loyal following, his big stage break came after supporting Crosby, Stills and Nash on their 1996 South African tour. After that he was signed to the SHEER (South African World Music label) where he has released over 10 albums. Shahosseini was born in Tehran on November 4, 1992. Her rare virtuosic talent on the Oud was discovered at an early age when she enrolled at the Tehran Music School. During her formative years she won many solo competitions which led her to study Persian traditional music at Tehran University. Her extraordinary unique style was taken notice by many diverse ensembles which resulted in her performing with the ‘New music orchestra’, ‘Meta X’, ‘Derang’ and ‘Three Ouds’. Since graduating in 2014, she has been lecturing at the Tehran music school and involved in many Oud workshops around the world. She has also performed extensively in Iran, Australia and Germany. In 2015 she released her first solo album, Gahan, to great acclaim. She is working now in Pouyesh an ensemble specializing in Persian traditional music. She is extremely excited to be working on a unique collaboration with Nibs van der Spuy to tour South Africa in February 2018. Join Nibs van der Spuy and Yasamin Shahhosseini on February 20, 2018, at 18h00 (doors open at 17h30) at the Centre for Jazz and Popular Music (CJPM), University of KwaZulu-Natal, Howard College. Level 2, Shepstone Building at UKZN Howard College Campus.